Hide Cables Behind Your Skirting Board! If you are renovating or redecorating your home, you will naturally want to create an area which is more aesthetically pleasing and tidier, without compromising on your electrical items. This can be difficult if you have a lot of cables, hence our cable space feature! Our cable space option allows unsightly cables and wires to run behind, and be concealed by, the skirting board around the edge of your room. Traditionally this would be done by chopping a channel into your plaster, running the cables along the channel, and replastering over the top. Instead, we cut a section or gap out of the back of the skirting board called a 'rebate'. When the skirting board is placed against the wall this rebate becomes a hollow through which wires and cables can be run. Cables must be in position before the board is fied onto the wall. No chopping, no plastering, no painting necessary. Running cables behind your skirting board instead saves you the time and mess of doing it the traditional way. 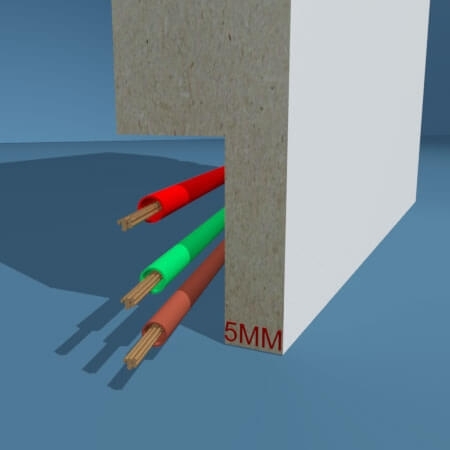 Just select our cable space option on the drop down menus when you come to order your skirting, and we will machine the rebate into the back of your board. We usually machine cable space rebates to a height of approx. 20mm. The depth of the rebate varies depending on the thickness of the board, but as a general rule of thumb we try and maintain a thickness of 5mm on the front of the board to preserve its strength. As an approximate guide rebates are generally machined at around these dimensions. 15mm skirting board = 20mm (H) x 10mm (D) rebate. 18mm skirting board = 20mm (H) x 13mm (D) rebate. 25mm skirting board = 20mm (H) x 20mm (D) rebate. Please note this is only an approximation. This may change depending on the design you have chosen or at the discretion of our machinest who may choose not to machine as deeply if it will compromise the strength of the board.